September 5, 2014 – The most accurate and comprehensive collection of rain, snowfall and other types of precipitation data ever assembled now is available to the public. This new resource for climate studies, weather forecasting, and other applications is based on observations by the Global Precipitation Measurement (GPM) Core Observatory, a joint mission of NASA and the Japan Aerospace Exploration Agency (JAXA), with contributions from a constellation of international partner satellites. “We are very pleased to make all these data available to scientists and other users within six months of launch,” said Ramesh Kakar, GPM program scientist in the Earth Science Division at NASA Headquarters, Washington. The GPM Core Observatory, launched from Japan on February 27, carries two advanced instruments to measure rainfall, snowfall, ice and other precipitation. The GMI instrument, built by Ball Aerospace, has 13 channels that measure natural energy radiated by Earth’s surface and also by precipitation itself. Liquid raindrops and ice particles affect the microwave energy differently, so each channel is sensitive to a different precipitation type. With the addition of four new channels, the GPM Core Observatory is the first spacecraft designed to detect light rain and snowfall from space. The DPR instrument was developed by JAXA with the National Institute of Information and Communication Technology. DPR adds another dimension to the observations that puts the data into high relief. The radar sends signals that bounce off the raindrops and snowflakes to reveal the 3D structure of the entire storm. Like GMI, its two frequencies are sensitive to different rain and snow particle sizes. One frequency senses heavy and moderate rain. A new, second radar frequency is sensitive to lighter rainfall and snowfall. 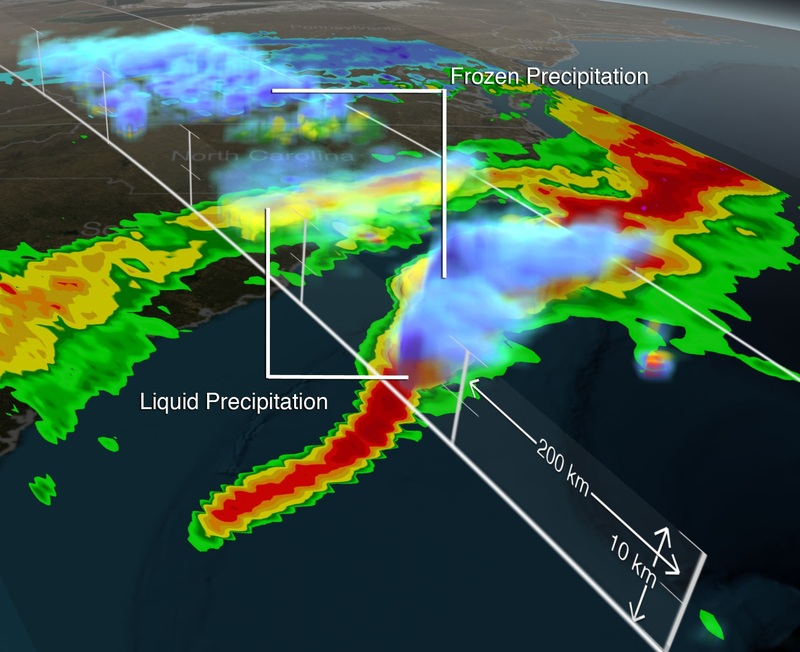 The advanced and precise data from the GPM Core Observatory are used to unify and standardize precipitation observations from other constellation satellites to produce the GPM mission data. These data are freely available through NASA’s Precipitation Processing System at Goddard Space Flight Center in Greenbelt, Maryland. In addition to NASA and JAXA, the GPM mission includes satellites from the U.S. National Oceanic and Atmospheric Administration, U.S. Department of Defense’s Defense Meteorological Satellite Program, European Organisation for the Exploitation of Meteorological Satellites, Indian Space Research Organisation, and France’s Centre National d’Études Spatiales. Instruments on the GPM Core Observatory and partner satellites measure energy naturally emitted by liquid and frozen precipitation. Scientists use computer programs to convert these data into estimates of rain and snowfall. The individual instruments on the partner satellites collect similar data, but the absolute numbers for precipitation observed over the same location may not be exactly the same. The GPM Core Observatory’s data are used as a reference standard to smooth out the individual differences, like a principal violinist tuning the individual instruments in an orchestra. The result is data that are consistent with each other and can be meaningfully compared. With the higher sensitivity to different types of precipitation made possible by GMI and DPR, scientists can for the first time accurately measure the full range of precipitation from heavy rain to light rain and snow. The instruments are designed not only to detect rain and snow in the clouds, but to measure the size and distribution of the rain particles and snowflakes. This information gives scientists a better estimate of water content and a new perspective on winter storms, especially near the poles where the majority of precipitation is snowfall. GPM data are freely available to registered users from Goddard’s Precipitation Processing System (PPS) website. The data sets are currently available in strips called swaths that correspond to the satellites’ overpasses. Daily and monthly, global maps are also available from all the sensors. In the coming months, the PPS will merge this instrument data from all partner satellites and the Core Observatory into a seamless map that shows global rain and snow data at a 6-mile (10-kilometer) resolution every 30 minutes. The GPM Core Observatory was the first of five scheduled NASA Earth science missions launching within a year. NASA monitors Earth’s vital signs from land, air and space with a fleet of satellites and ambitious airborne and ground-based observation campaigns.